Any type of pain can cause you to lose sleep, or even wake up in the middle of the night. When it comes to shoulder pain, staying away from the problematic side helps a lot. The best pillow for shoulder pain comes in the shape a side sleeper pillow. This lets you sleep on your good shoulder. This way you can keep the aching shoulder form pressing against anything which helps prevent the pain from occurring. The side sleeper pillows below offer a combination of comfort as well as support. The support is important as it needs to prop your head up enough to keep it level with your spine. This way you don’t wake up with neck or upper back pain. Here are the top products to consider. Best Pillow for Shoulder Pain: Among the different pillows available, this comes out as our top pick for anyone who’s suffering from shoulder issues and having difficulty sleeping due to the pain or irritation. This product, is a body pillow. So it isn’t the same as the regular sleeping pillows in shape or in size. This makes it something that you may or may not like using depending on whether you like using the larger body pillows. The Leachco Back n Belly Body Pillow is specially contoured to support your whole body during rest. It lets you sleep on your side (the non painful one) by propping you up and offering support to the back, hips, legs and head. To do this it uses its narrow U shaped design and an hour glass like inner contouring to provide support to your whole body, back and torso. There is no need to ‘fluff up’ your pillow in order to get comfortable; simply re position yourself and the Back n Body pillow will do the rest. This Leachco product is made of polyester and comes with a removable, machine washable cover. This makes it easy and convenient when it needs to be cleaned. The pillow can be manipulated and shaped to your liking and to provide support where you need it most. The two ‘legs’ on the open end of the pillow can be overlapped to provide more elevated support for your head, neck and shoulders. Alternately you can keep your upper body on the closed end and overlap the ‘legs to elevate your hips and lower limbs. The body pillow also works well as a back support if you wish to read or watch television in bed. Its versatility makes this the best pillow for shoulder pain. Next up is a more conventional looking pillow. But not quite yet. The SertaGel Memory Foam Pillow has a distinctive rectangular shape which allows it to be especially effective in establishing proper spinal alignment for slumbering side sleepers. It is designed to suit both side sleepers as well as those who sleep on their backs. It also offers a firm enough support that your body stays aligned should you decide to sleep on your side. The use of memory foam gel in this pillow means that you will not suffer from aches and pains caused by pressure points that arise from the pillows inability to return to its original shape. The foam used in this Serta pillow is designed to maximize air flow so users will tend to remain comfortably cool while using it. This makes it more comfortable, as least with regards to temperature, compared to memory foam pillows that aren’t fitted with gel. The SertaGel Memory Foam pillow weighs 4.8 pounds. Its dimensions are 23” long and 17” wide. It is 3” high. This is as close as we get to regular pillows in our quest for the best pillow for shoulder pain. This pillow for its part is regularly shaped unlike the rest of our picks in this review. It is however a memory foam pillow. The memory foam offers the support and loft to let you sleep comfortably on your non-painful shoulder. This makes it important as you want to keep a good spine alignment if you’re a side sleeper. The pillow also works well for back sleepers who want support. You can try this sleeping on your back and see if it doesn’t irritate or agitate the pain in your shoulder. Otherwise we recommend sleeping on your non-painful side. The Coop Home Goods Shredded Memory Foam Pillow is sold with a 5 year warranty that the pillow will not go flat in this time. The foam, unique to this manufacturer is effective in returning quickly to its original shape. This means the person using it will not have sleep disrupted by painful pressure points developing in response to the pillow losing its shape. This shredded memory foam pillow is also unusual among foam pillows because the inner foam layer can safely be laundered in a washing machine. We also like this pillow as it is resistant to dust mites and other allergy causing particles. This pillow is designed to bring the advantages of down and foam into one pillow. Shredding the foam gives the pillow some of the plushness of down while maintaining the stability of foam. If you need extra height from your pillow when you sleep, this Classic Brands Conforma memory foam pillow is five inches thick giving you that extra loft you want. The manufacturer of this pillow designed to be especially suitable for those who sleep either on their sides or back. Also, this is a medium firm memory foam pillow has been designed to maximize air flow. This makes it result in a more comfortable sleep for its users. You’ll notice the small holes lined up in the pillow which allow for air to circulate. This helps in reducing the heat that’s often associated with memory foam pillows. The cover of the pillow is likewise designed to maximize air flow. 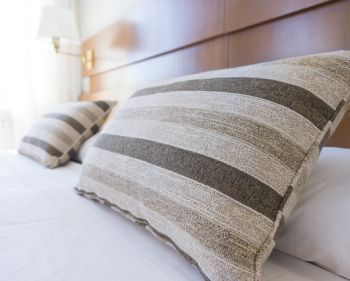 The foam interior of the Conforma memory foam pillow can be machine washed as needed providing that you follow the manufacturer’s instructions carefully. This pillow is offered in king and queen sizes. The best pillow for shoulder pain lets you sleep better without having the injured or aching shoulder bother you. This not only helps increase the duration of sleep so you get the proper 7 to 8 hours of sleep nightly but also lets you get deep sleep.